Before you prepare your first cup of coffee each morning, do you already feel exhausted and overwhelmed? These are just two signs of parental burnout. Other symptoms may include irritability, emotional detachment from your family, depression, and a lack of motivation. If any of these resonate with you, you may be suffering from excessive stress as a parent. Know that you are not alone. Parents from all walks of life experience this from time to time: working mothers and fathers, single mothers, stay-at-home mothers, and moms and dads who have children with special needs. In fact, parental burnout is becoming increasingly more common than in previous generations due to the incessant pressure to be a “perfect parent,” which is nothing more than a modern-day myth. Over time, not learning how to manage parental burnout can lead to physical and emotional ailments. Children also suffer from not getting the emotional nurturing, attention, and discipline they require, thus leading to a decline in their emotional, physical, and behavioral functioning as well. One of the most significant challenges in today’s hectic world is putting aside time to experience quality family connectedness. Parental burnout makes this even more challenging. While there are many helpful articles about how to handle parental exhaustion, much of it is theoretical. 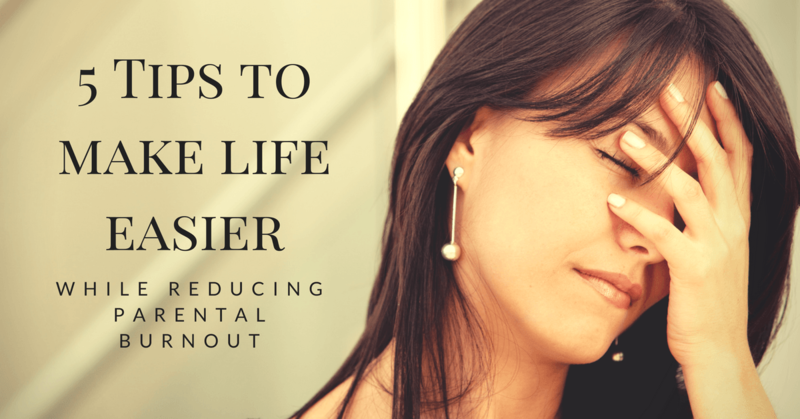 I am offering practical, solution-focused strategies you can use right away to make your life easier which will help to reduce burnout. My hope is that by using these five tips, you will you feel less stressed as a parent, and you will gain more quality time your family. “Spend less time shopping and more time on the things you love,” says Amazon. Take advantage of Subscribe & Save and receive recurring monthly deliveries of items that you regularly purchase, such as diapers, baby food, school snacks, and toiletries. Best of all, you will receive a discount of up to 15% for ordering 5 or more products in any given month. You can skip deliveries at any time, and as always, Amazon Prime customers get free shipping. Does it seem as if you’re always out of birthday wrapping paper whenever your child receives an invitation? Purchase gender neutral wrapping paper in bulk so you won’t be running to the store last minute. Buying boxes of assorted greeting cards can also be a huge time saver. Amazon.com and locations such as Costco and Sam’s Club are some of the best places to buy in bulk. Should you have a Hannaford grocery store in your area which offers the “Hannaford to Go” program, take advantage of it! Customers order online, select a pickup time that works best for them, and pick up their groceries curbside. Groceries are loaded into your vehicle while you pay from your car. Walmart has a similar program. If you’re not located near these particular stores, ask your local grocer if they offer an online service. If you’re making a meal such as baked ziti, double the batch and freeze the other half for another evening when you’re busy and don’t have time to cook. You’ll be so glad you did it when you come home late from work and have to take the kids to baseball practice that evening! Typically, I would advise staying away from social media sites such as Pinterest and Facebook, as they tend to make parents feel guilty and less than perfect. Remember, there is no such thing as a perfect parent, but there is a “good enough parent,” and that is someone who consistently cares for their child. If you absolutely must use social media, search for “parenting fails” on Pinterest. You’ll soon be laughing away any guilt you may have as you realize that we are all essentially the same. No parent is better than the other, and we all make mistakes. I personally find viewing “cooking fails” on Pinterest to be the most enjoyable and gratifying. Who can’t relate to that as a parent?